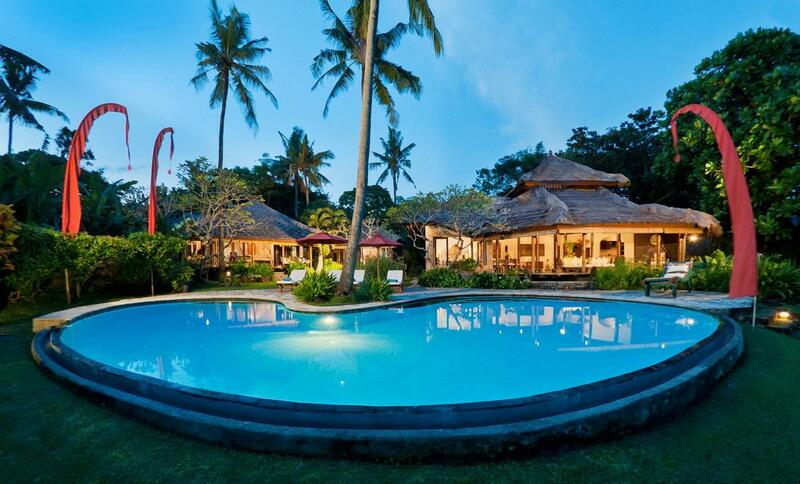 The villa is a holiday hideaway situated on Seseh Beach on the southern shores of the island of Bali. 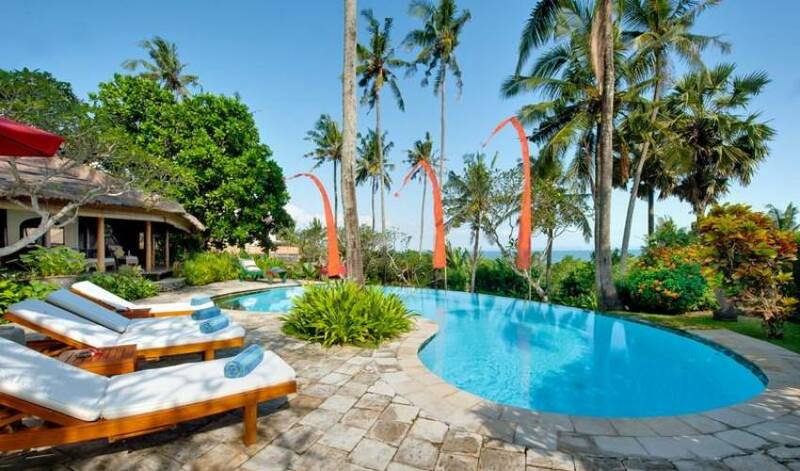 The villa enjoys direct access to the beach and is just a short drive away from the bustling tourist areas of Canggu, Kuta and Seminyak. It is the ideal location for a calming beach getaway yet with the luxury of a fully serviced villa. 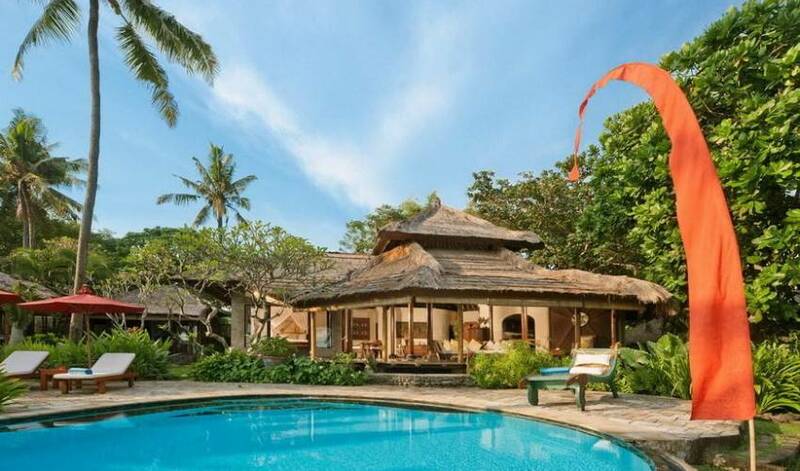 The villa is built in traditional Balinese style with a design plan created by well-known Balinese Architect, Po Po Danes. The free flowing layout and open tropical gardens highlight the natural beauty of the island, while creating a warm and welcoming space. There are three suites spread throughout the property, each standing on its own. The main house is set back from the beach, with a garden dotted with graceful water fountains reaching out to the beachfront. 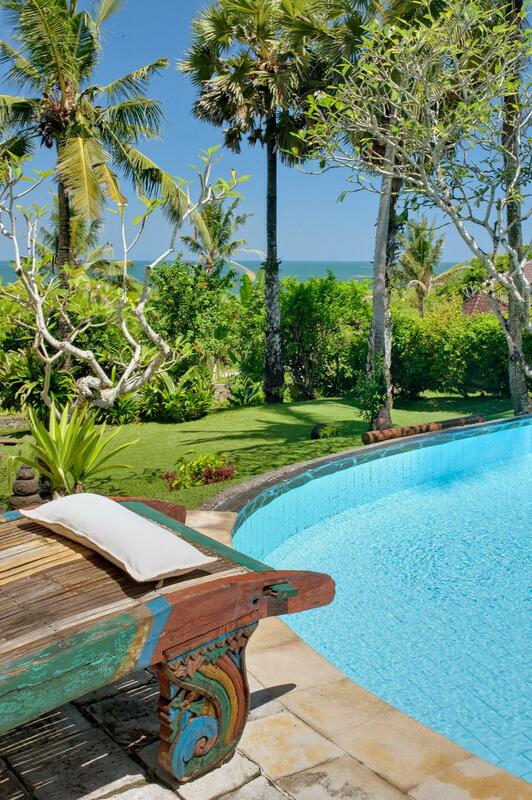 The centerpiece of the property is the free form salt-water infinity pool overlooking the rich gardens. The open, cathedral style living and dining room commands views of the pool, the garden and the ocean beyond. The interiors have been decorated with unique Balinese and Javanese antiques, combined with modern Asian touches, creating an elegant and inviting atmosphere. 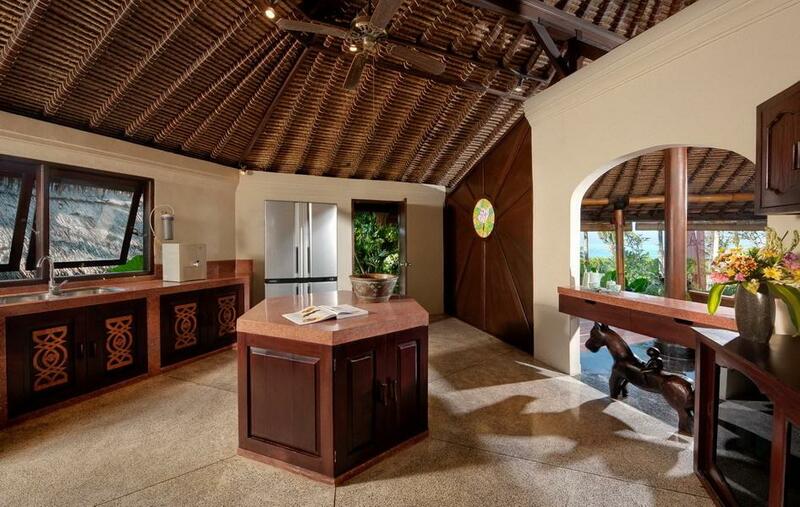 The common areas of this villa include a living room and a dining room. Both stand in the main part of the house, separated from the suites to offer the utmost in intimacy. Both the living room and the dining room are graced with traditional thatched alang-alang roofs, creating a distinctly Balinese feel. With a cathedral style roof rising 16 meters, the cool breezes of the Indian Ocean circulate through the open living room. Everyone’s favorite chill-out space, the villa's living room features a large hexagonal shaped couch and an assortment of comfortable spots to enjoy the day. The dining room is elegant and inviting, with a hand-carved Warisan table seating up to eight guests. Enjoy a light breakfast in the warm sunshine or a decadent dinner while overlooking an ocean dotted with the lights of the local fishing fleet. The Lotus Suiteis our luxurious master suite with sleek, modern Asian design accents. 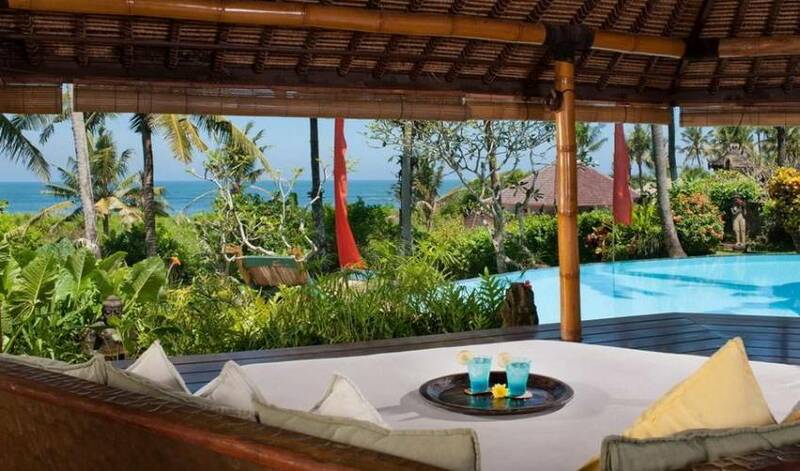 The bedroom looks out over the tropical garden landscape and the swimming pool, with the Indian Ocean coloring the background. A extra king-sized bed, handcrafted by Bali design house Warisan, rests atop solid Mahogany wood flooring. The bedroom features an en suite marble bathroom, with a very large Terrazzo bathtub and a separate open air shower. The bedroom also boasts a spacious walk-in closet and a safe for your personal belongings. The Lotus Suite also features a seductive Turkish Day Room, including a Turkish style day bed complete with lavish pillows, for relaxing in chic style. Unwind with a DVD, or watch any of the 30 international satellite channels or play some mood music on the stereo. This room can also double as a children’s room, for guests traveling as a family. Slide open floor to ceiling glass doors and let the ocean breezes wash through this cozy suite. Situated at the front of the property, this suite enjoys the most stunning views of the ocean, pool and swaying palm trees. 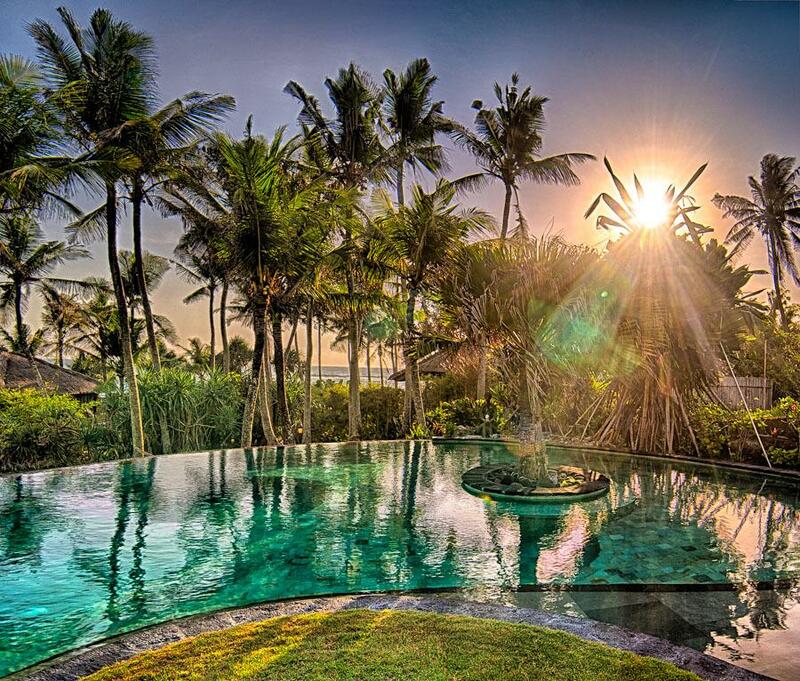 Step out onto the patio to enjoy an unparalleled Bali sunset. The suite features hand laid mahogany floors and a queen-sized bed. Take care of last minute travel or work obligations at the writing desk and store your personal treasures in the antique wooden chest. The freestanding bathroom is constructed in elegant marble and is equipped with a tropical open-air shower, ideal for showering under the stars. This guest suite looks out on the Indian Ocean and the villa’s tropical gardens. It is is decorated in sleek, modern Asian style, highlighting a palette of dark browns, blues and white, to mimic the natural landscape. In the bedroom, the centerpiece is a queen-sized bed set atop hand-laid mahogany floors. The open-air veranda provides a great place to read a book or enjoy a morning coffee or tea. The en suite bathroom is tiled with marble and features a luxurious bathtub and open-air shower. 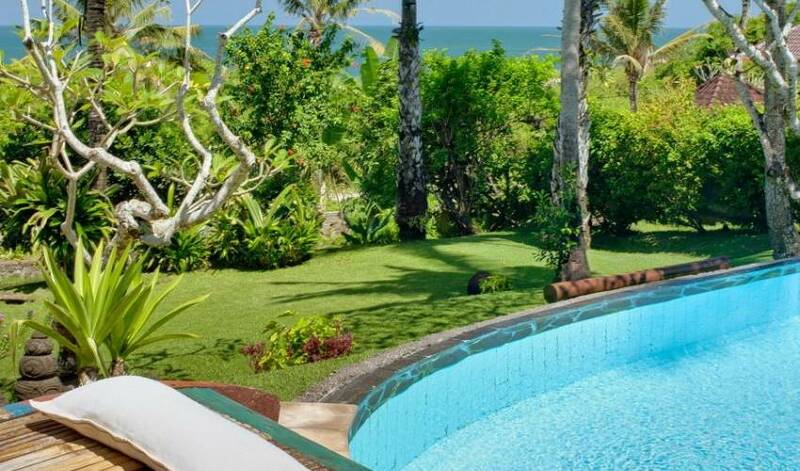 Nestled just a stones throw away from the Indian Ocean and set against the lush backdrop of lush rice paddies is this villa, set in almost 2,500 square meters of land. 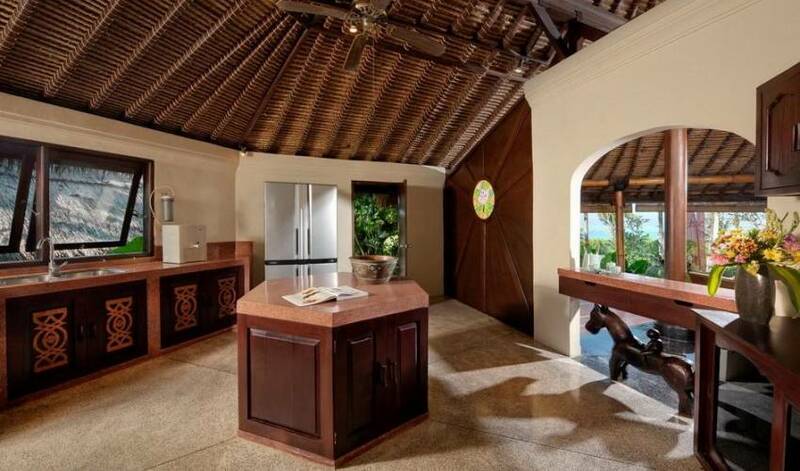 The villa is the ultimate escape to paradise, surrounding guests with natural beauty, tranquility and relaxation. 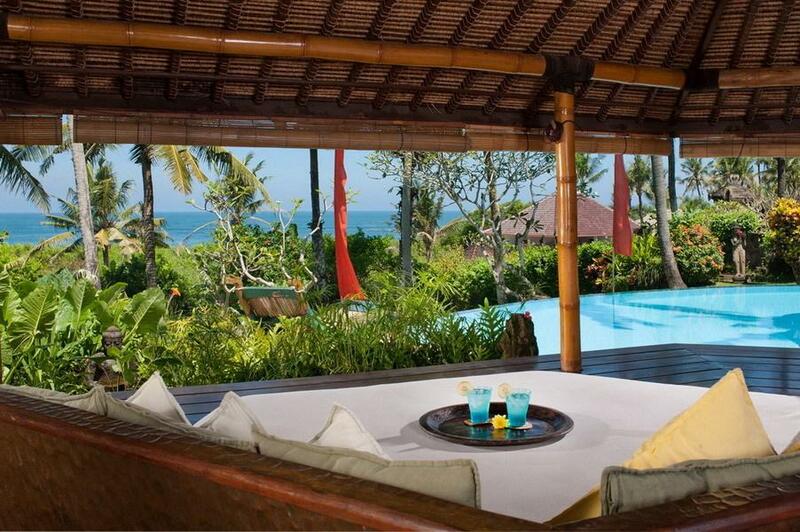 The villa’s oceanfront location boasts views of Kuta and the Bukit peninsula. It is the ideal spot to witness one of Bali’s famous water-colored sunsets or to simply spend the day relaxing under swaying palm trees and listening to the gentle crash of waves on the beach. 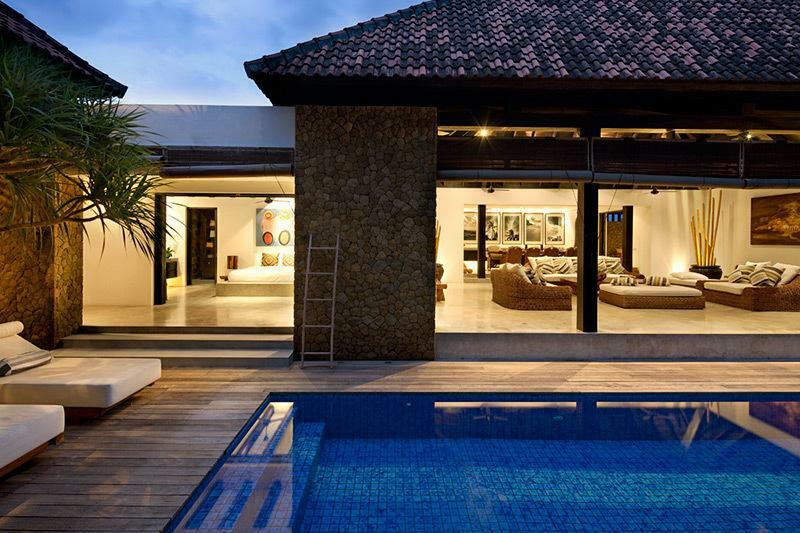 With an increasing number of dining spots and facilities in neighboring Canggu, the villa combines a near perfect mix of convenience and exclusivity. 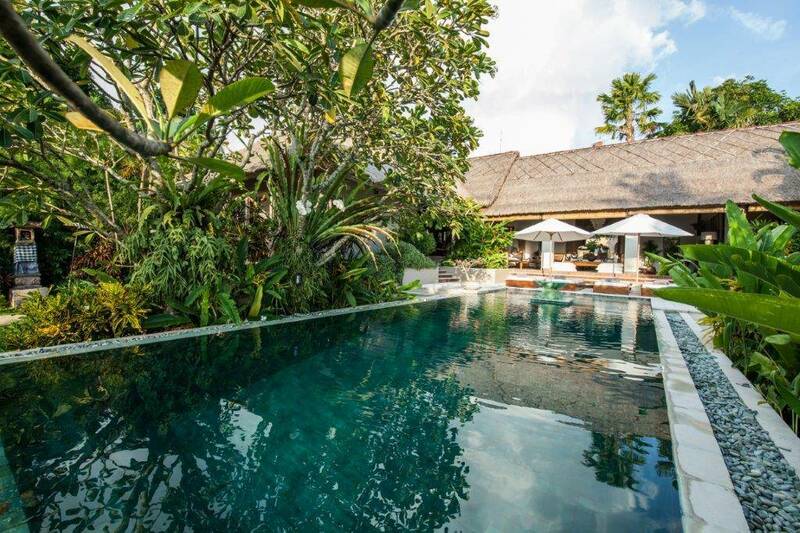 The villa is located just north of popular surfing spots and the shopping, clubs and dining spots of Seminyak are less than 20 minutes away. 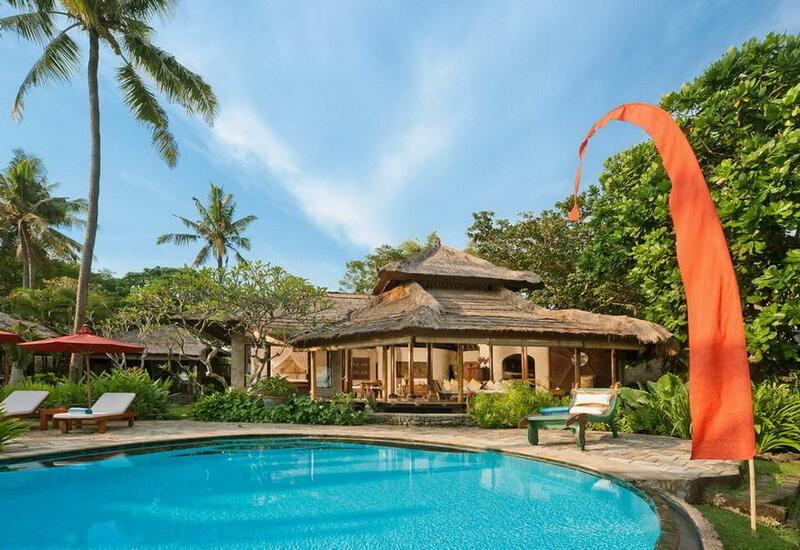 The island’s artistic community of Ubud is 45 minutes north of the villa, while the world class greens of the Nirwana Golf Course is a mere ten minutes away. 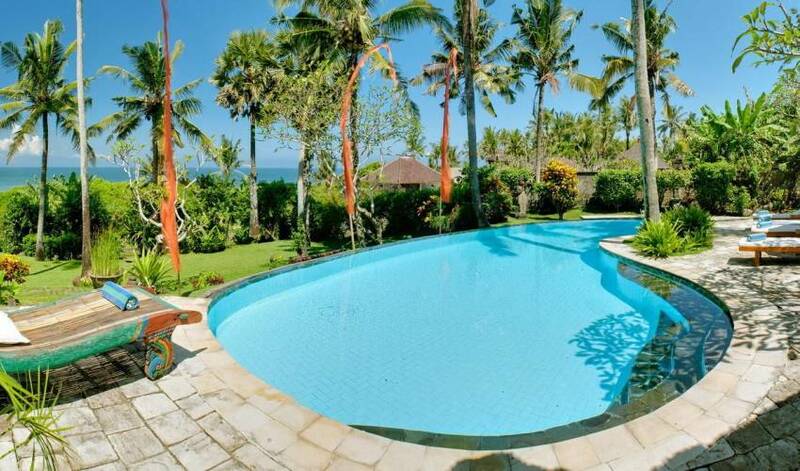 The villa is approximately 30 minutes from the Ngurah Rai International Airport.